Volkswagen has revealed the latest incarnation of the e-Golf at the LA Motor Show. The all-electric family hatch is more powerful and gets more equipment than before. It will also officially travel 50 per cent further. It should reach UK showrooms by the summer of 2017. As well as more power and more range, the e-Golf gets styling updates that bring it in line with the updated petrol and diesel Golfs, which were recently unveiled in Germany. 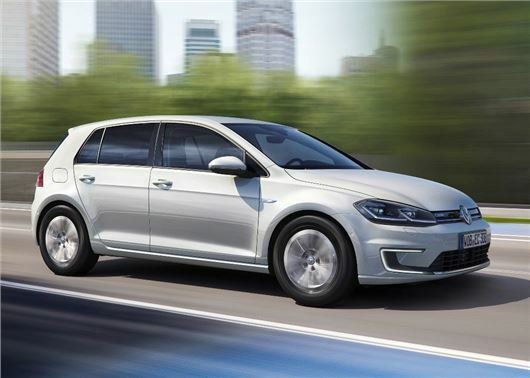 Pricing it yet to be confirmed, but it isn't expected to venture too far from the current e-Golf's £27,000 list price, after the Government grant. The improvement in range is largely down to the new batteries, which have been improved from 24.2kWh to 35.8kWh; however, while the official range for European cars is 186 miles, Volkswagen has told US customers that this figure will be closer to 125 miles in real word driving conditions. Volkswagen tell us that the battery can be charged to 80 per cent within an hour, from a fast charging point, or fully replenished over six hours from a standard wall box. The electric motor has been beefed up from 115PS to 135PS, while peak torque has been improved to 290Nm.﻿ As a result, the e-Golf will cover 0-62mph in less than 10 seconds. The five-door body is almost identical to the old e-Golf, although the bumpers and front grille have been reworked to give the car a sleeker appearance. LED head and tail lights are also fitted as standard, along with ‘animated’ indicators that swipe across instead of blinking on and off. The interior remains largely the same, although there’s now a fully digital instrument binnacle and a new 12-inch infotainment system that can be operated with hand swipe gestures. Autonomous driving aids have been improved too, with Traffic Jam Assist that will effectively drive the car up to 40mph and automatically apply the brakes when the vehicle in front stops or a pedestrian steps out in front.